We explore network benefits to suit all tastes. Every one of us is different. Some of us love football, but some of us hate it. Some of us can’t think of anything better than a day of shopping – some of us can’t think of anything worse. And when it comes to a night out, while some of us love going out, others like to go out-out. We all like different things, and when it comes to choosing a mobile network, it makes sense to go with the one that gives you what you want. And if you’re a student, you’ll need to consider all the perks you can get your hands on, not just Monday night 2-4-1 drinks. Read on, as we take a look at some of the great benefits on offer – based on the things you love. Some Vodafone pay monthly plans come with free Spotify premium. That means you get access to millions of tracks, without having to suffer the ads. You can download your favourite albums and playlists and listen offline – and in any order. With EE, you could get six months of Apple Music for free. That’s six months of classic tunes, new releases, bonus video content and more – all for free. Usually, you’d pay almost £60 for that. Hook your music up to a Bluetooth speaker and you’ve got the ultimate student house party playlist right there – and the best bit is, you get to choose the soundtrack. If your idea of a great night out is going to see a gig, O2 Priority from O2 might be right up your street. With Priority, you could get tickets to see some of the biggest artists before anyone else. But it’s not just about the music. You’d also get great offers and discounts for entertainment, food & drink and shopping, plus exclusive competitions, prize draws and more. Back to Vodafone now, the network to consider if you like watching your favourite shows on the go. Whether you’re heading back on a long journey to visit your parents, or killing some time in town while you’re waiting for your mates to arrive, a NOW TV pass – available on some plans – will let you keep up with your favourite TV. We mentioned football at the start. Well, if you’re on the side of the fence that loves your football (and other sports besides) there are two options worth exploring. Get free access to the Sky Sports app with your entertainment pick through your Vodafone contract, or get three months access to the BT Sport app through some plans on EE. 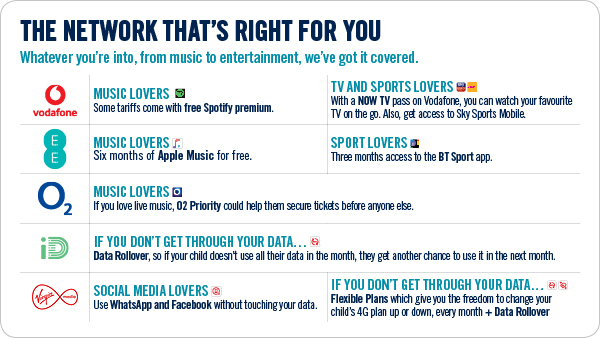 It’s worth mentioning that you only get access to one of these benefits through your Vodafone contract, so pick the one (music, TV, sport) that you’re most interested in. If you spend a whole load of time on social media, and just… can’t… stop… WhatsApping – it happens to the best of us – Virgin Mobile lets you use WhatsApp and Facebook without touching your data. So, there you go. Whatever you’re into, there’s a network benefit for you. One tip from us, though: make sure you check what your chosen network’s coverage is like in your hometown and university town before you sign up – just so you don’t get stuck with dodgy reception for the length of the contract.